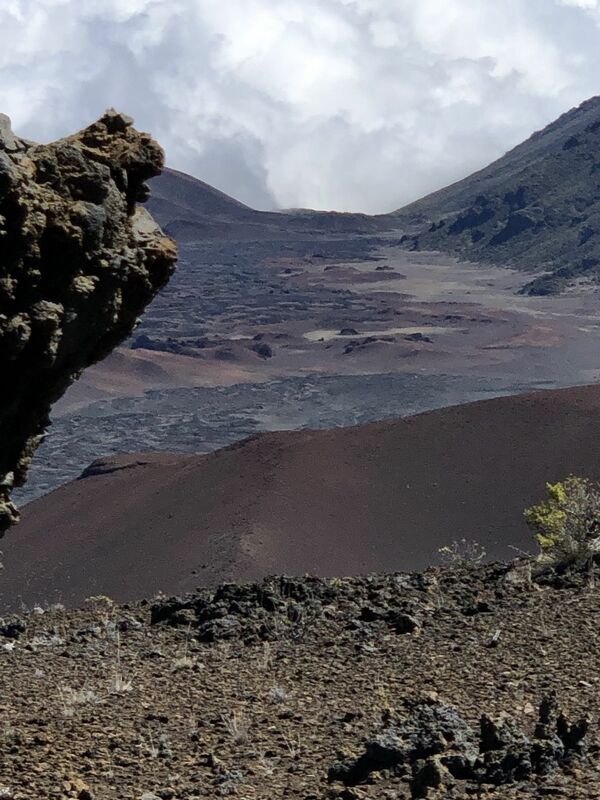 Ka Lu'u o ka O'o Cinder Cone Via Crater and Sliding Sands Trails [CLOSED] is a 8.4 kilometer moderately trafficked loop trail located near Kula, Maui, Hawaii that features beautiful wild flowers and is rated as moderate. The trail is primarily used for hiking, walking, nature trips, and bird watching and is accessible year-round. 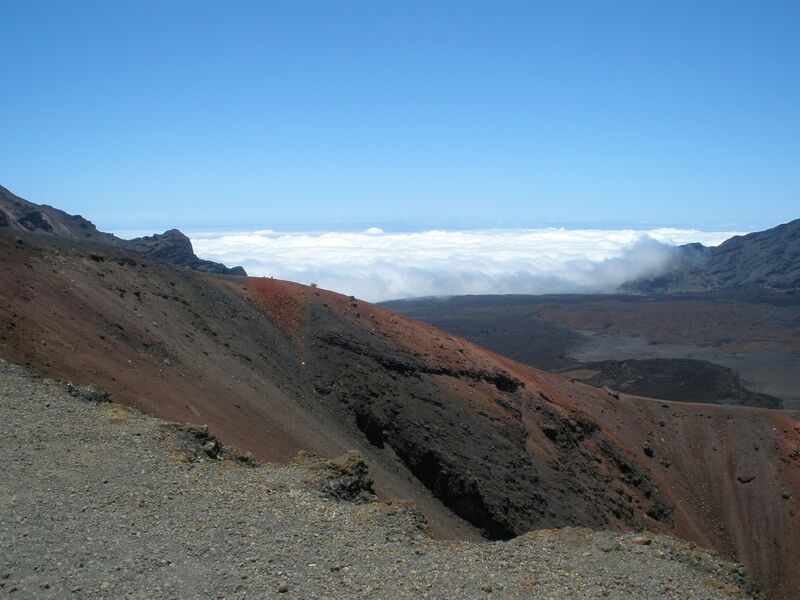 The trailhead for our short hike is located at the opposite end of the parking lot from the Haleakala Visitors Center. We're heading for the Sliding Sands Trail, which contrary to it's name is comprised of well compacted cinder and soil, making for a relatively easy hike. 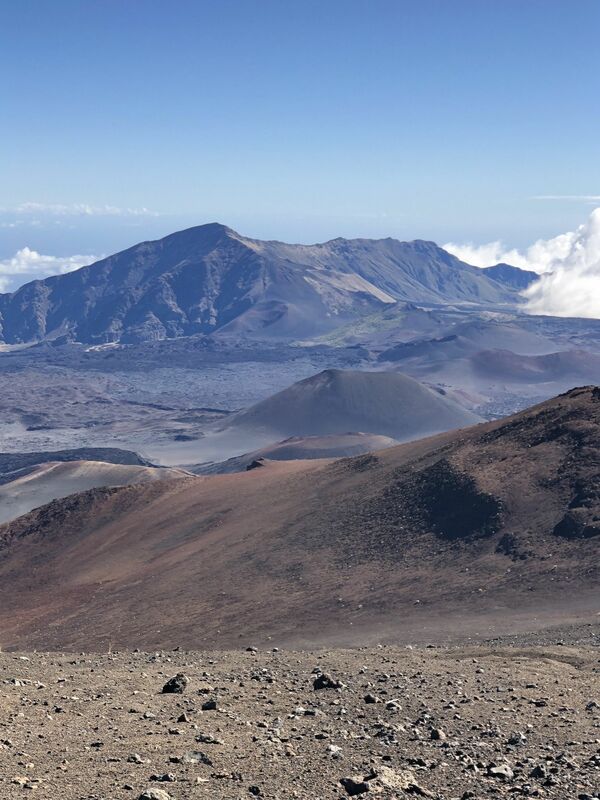 Be sure to take a quick side-trip in the car to Red Hill, which marks the very tallest peak on the island of Maui. 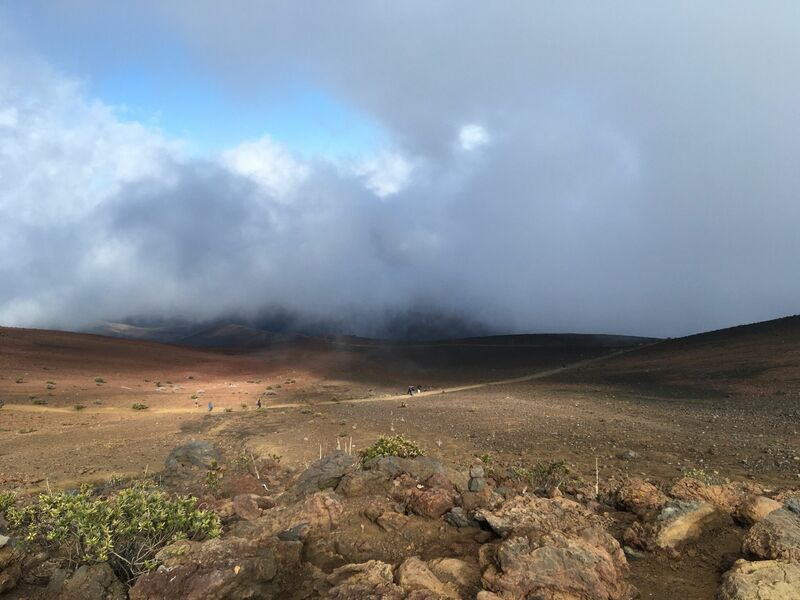 Cast your eyes in an Easterly direction past the domed observatories, and on a clear day you'll be able to spot the Big Island of Hawaii. Approaching the rim of the crater, it's sheer size immediately impresses. 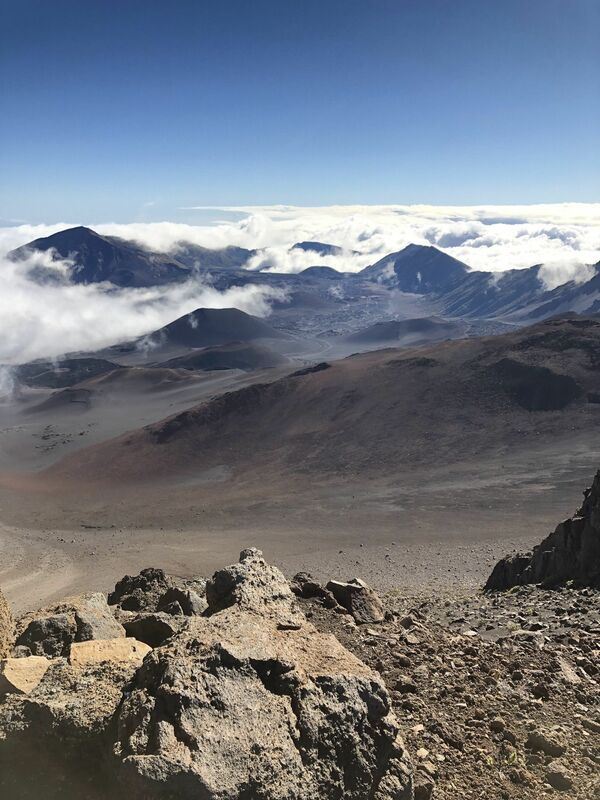 You can see why some hike in with their tents and choose to spend several days exploring the summit of Haleakala. 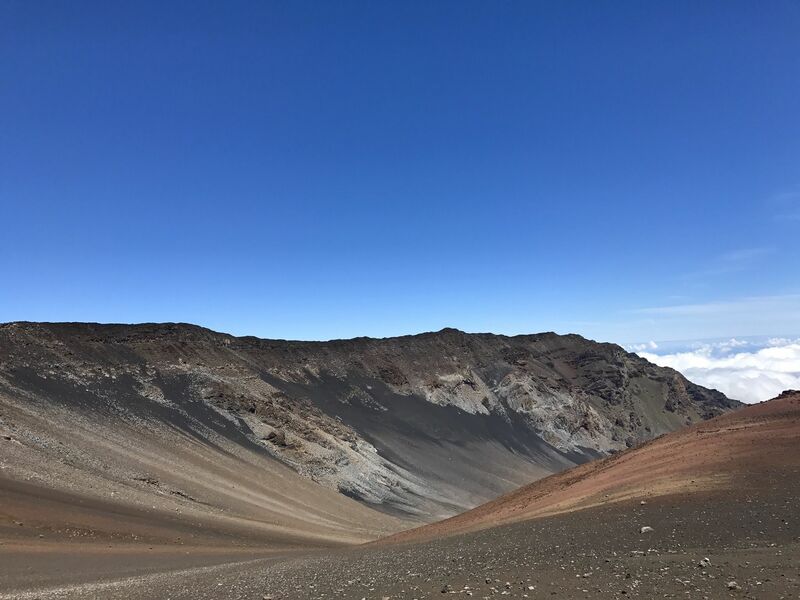 Despite Haleakala being a shield volcano, what you're seeing in front of you is not a single volcanic crater - known as a caldera, but instead the eroded remains of the mountain's summit which has been worn away by wind and water. 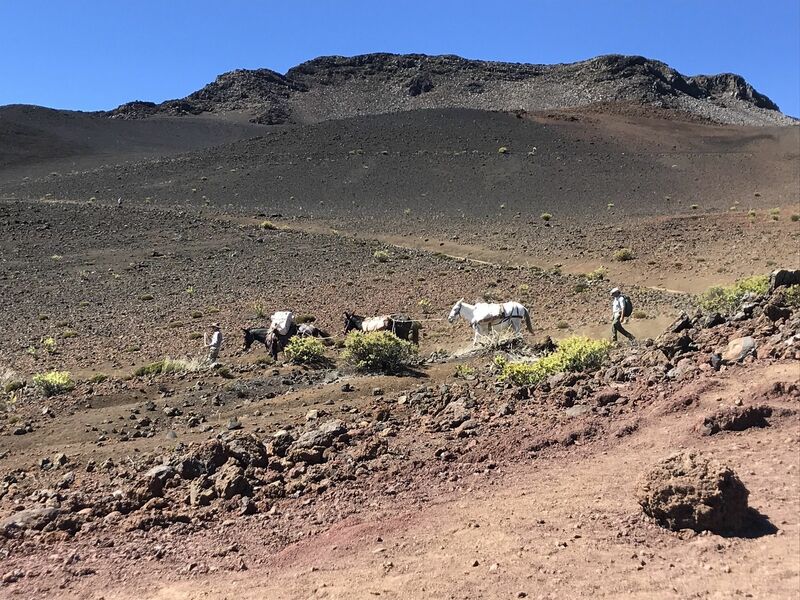 If you're looking for calderas you needn't be disappointed however, as all around you is cinder cone after cinder cone, each ringed with its own caldera. It's to one of these that we're now headed. The desolation and the eerie red color of the landscape around you give this remote location an other-worldly appearance, which is only compounded by the strangeness of the plantlife. 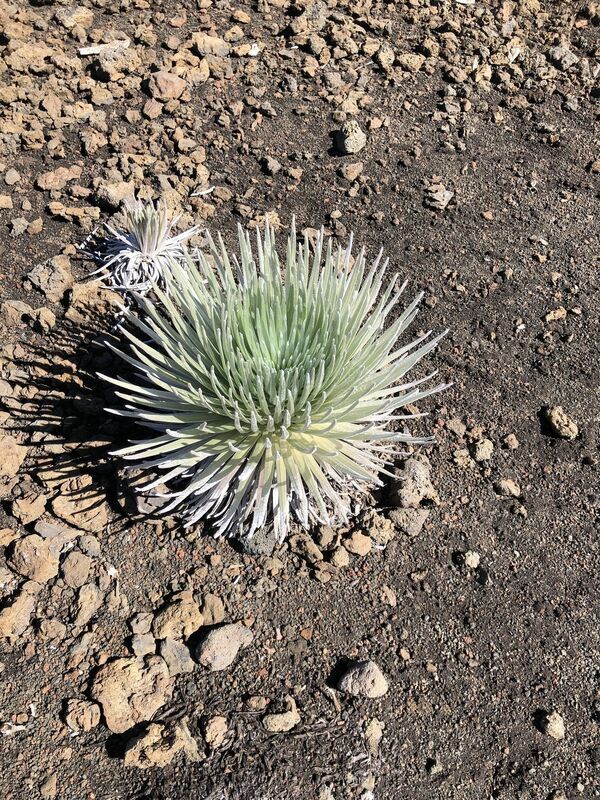 Dotted around the landscape you'll find the silversword, a whitish-green plant unique to Hawaii. Please take great care not to disturb these shallow-rooted plants which are a threatened species. Almost exactly 2 miles into the Sliding Sands Trail you'll happen across a well marked sign signalling our diversion towards the closest caldera. 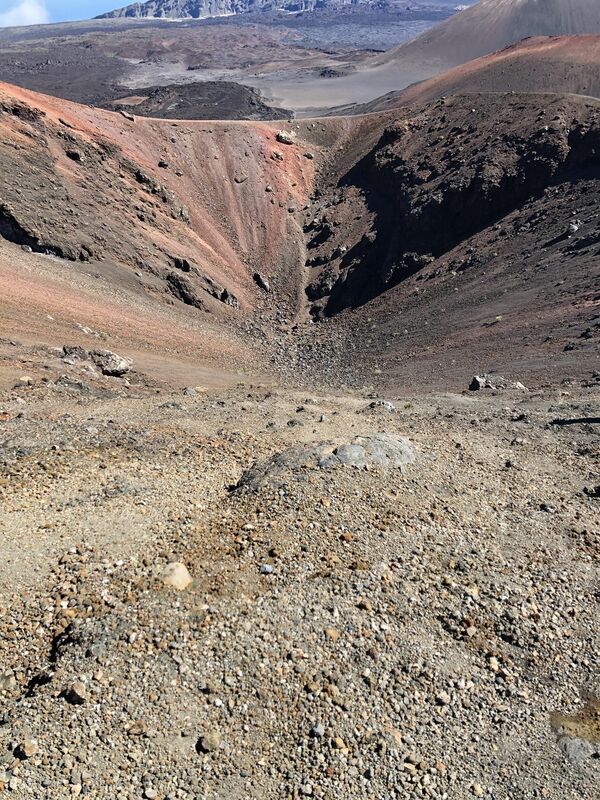 Take the left turn and head towards the crater known as .. well, we'll let you decide out how to pronounce it's name. 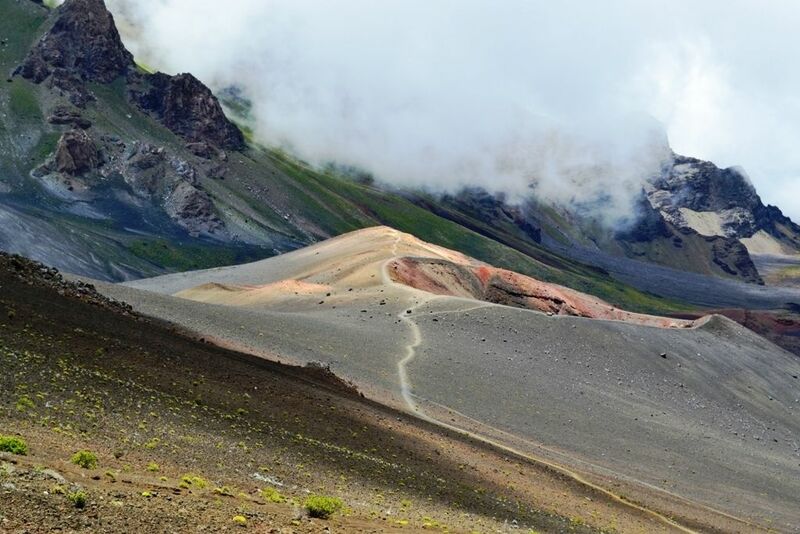 Take a stroll around the dramatically red-rimmed crater of Ka Lu'u o ka O'o, while keeping a respectable distance from the edge (don't worry though .. there's no real danger here). Sad to see this is closed but totally understand why. Hiked here in 2016 on our honeymoon. We had no intention of visiting this crater but were following a couple locals - it was beautiful but in hindsight very dangerous. It takes THOUSANDS of years for the landscape to recover when humans leave the trails here - respect the rules so we can all continue to enjoy the magic of this place! This trail is PERMANENTLY CLOSED. Please do not hike it. 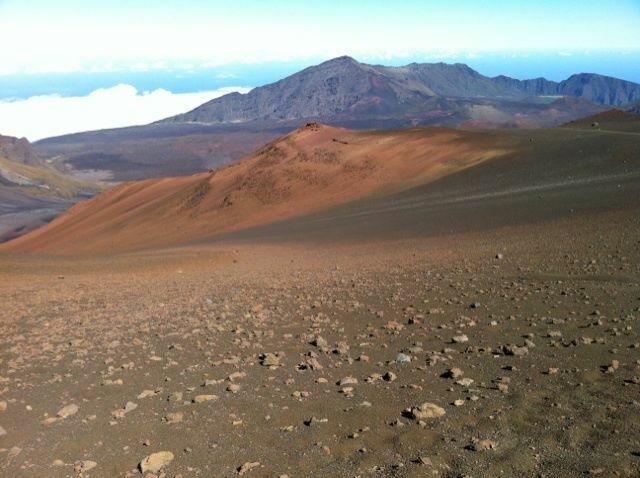 Too many hikers on this trail started to destroy the cinder cone that it loops. This is a federally designated Wilderness area. Hiking off trail is against the law. 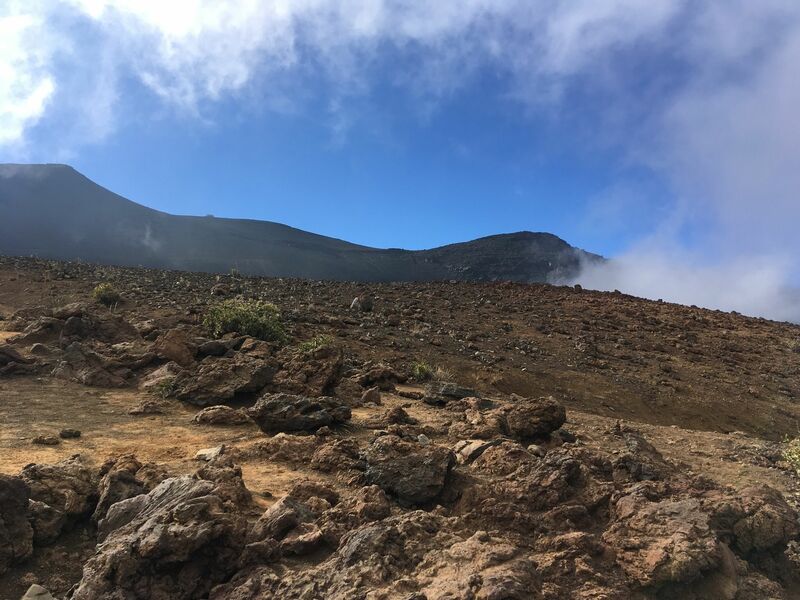 The Sliding Sands trail is open but the 2 offshoots to Ka Lu’u O Ka O’o are CLOSED! You can still see the areas that acted as trails but the are no longer open to the public. 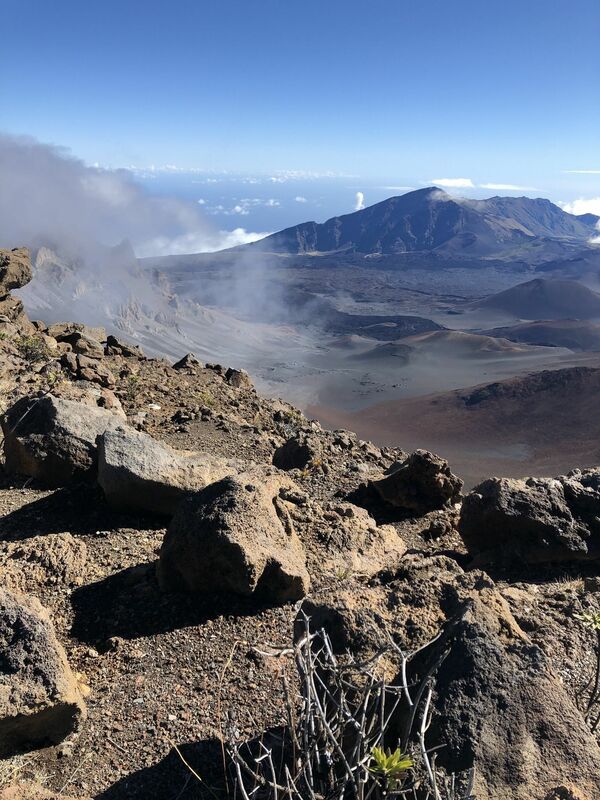 People who continue to traverse the path leading to and around Ka Lu’u O Ka O’o are breaking park regulations. The hike in is like landing a spacecraft on a foreign world, totally amazing and unique. The hike out is like you crashed your spacecraft and you are stranded lol. Hiking out is pretty tough as it is obviously uphill and the majority of time in loose sand for 2 miles. Definitely bring sunscreen, extra water, and a little trail snack and just take your time. One of a kind experience for sure. Time it right and get back to the car for sunset at the summit, I found it just as remarkable as the sunrise with much less traffic and no need for a reservation. Stargazing about an hour after sunset is a nice bonus as well. This hike took me and my 16 year old son about 3 hours and 45 minutes round trip. I've hiked this twice, both times many years ago. Gorgeous! Beautiful, weather changes quickly! Hiked out with maybe 10ft visibility. 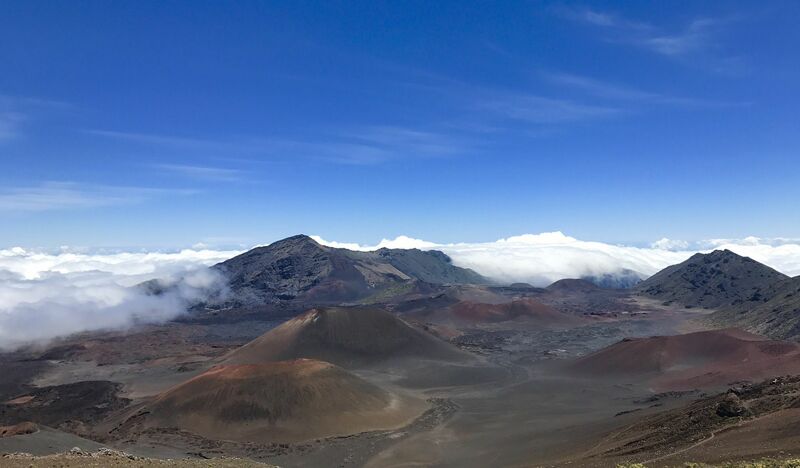 NOTICE (12/26/2017): the trail access to Ka Lu’u o Ka cinder cone off of sliding sands trail is CLOSED. The sliding sands trail, however, is still open. 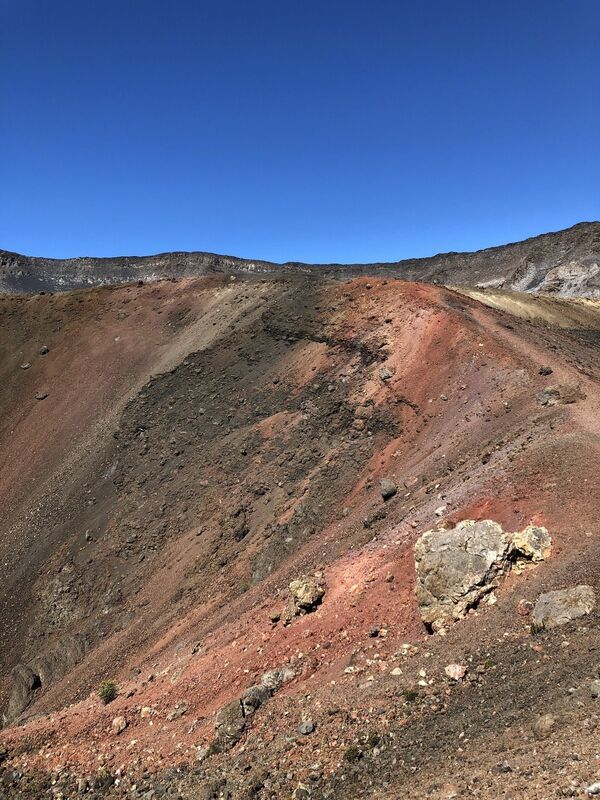 Trail still offers great panoramic views of the entire hike, but a bit disappointing as there is no access to the cinder cones. My first review, I just could not keep it to myself. Gorgeous hike. I would suggest to check the weather a few days ahead when you are in Maui and decide when exactly you want to go. It may get foggy and in this case you will not see anything. It is very easy and fun walk down hill and may get a little challenging on the way back, but just take your time, it is worth it! We made it back in one hour since took all of the pics on the way down. It definitely seems like you are on another planet. Absolutely unreal. One of the best hikes I have done! I hiked in shorts and sweater, would definitely get cold without it. We were back just in time for sunset on the summit (which is a whole other story). Unfortunately, the trail to Ka Lu'u o ka O'o off of the sliding sands trail is closed. Apparently it's been closed for a while, and it's not shown on the official park map. We went looking for it, and found the trail junction has been removed and a trail barrier established to make it look like there was no junction there. Beyond the old junction, there is a sign which says "trail closed due to emergency conditions"
2 stars so people know what the situation is. But overall, it's a still a worthwhile hike.